Long before Ray Kinsella assured Shoeless Joe Jackson that, no, this wasn’t heaven, “it’s Iowa,” a plane full of NBA players and staff rightfully could have wondered the same thing about their own field of dreams. Fifty-three years ago, the Minneapolis Lakers didn’t come back from beyond to play a basketball game in rural Iowa – they almost went in the opposite direction when their team plane experienced mechanical issues while carrying them home from a game that night against the St. Louis Hawks. 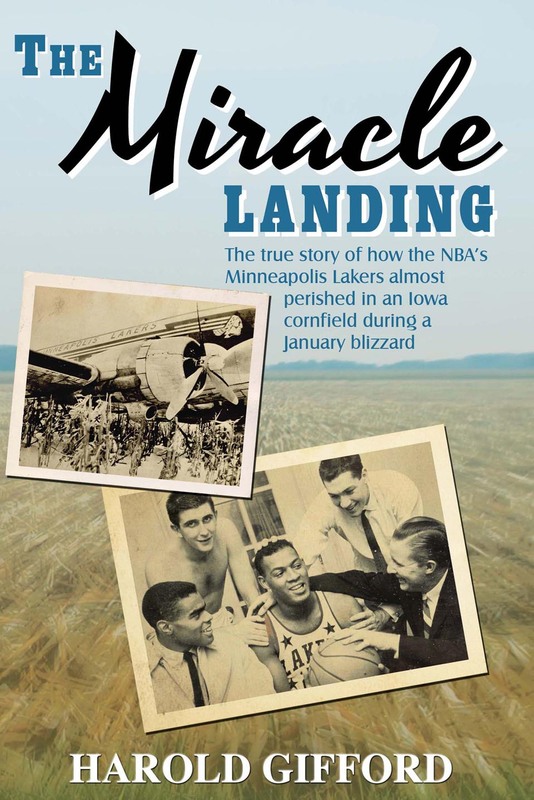 That harrowing trip and its impropable stop in a confield in Carroll, Iowa, is the subject of a new book, “The Miracle Landing” (Signalman Publishing, May 2013) written by the co-pilot that night, Harold Gifford. Straight to the point, certainly. But it only suggests at the implications of what might have been. Or rather, what might not have been. The NBA was a more raggedy operation in those days, after all. The Lakers were a proud franchise with five championships in their past, but they had fallen on hard times in the Twin Cities. George Mikan was long gone and, because of difficulty securing a proper place to play, so were many of their fans. By 1959-60, the team was losing twice as many games as it won; even a stellar rookie named Elgin Baylor couldn’t pull Minneapolis closer to St. Louis in the Western Division than 21 games. Owner Bob Short, who owned the DC-3 plane, was within months of relocating the whole shebang to Los Angeles, where the No. 2 pick in the 1960 draft, Jerry West (selected right after Oscar Robertson), would join Baylor for the start of what has been the franchise’s long, glamorous and successful stay in southern California. Still, it’s safe to say that if the unthinkable had happened, the NBA might have moved on. It would have been in no hurry to replace a team in the Twin Cities and it might have been years, through expansion or another franchise move, before the league planted a flag in L.A. Certainly, it wouldn’t have been named the Lakers. That, of course, is the real happy ending. But the NBA by-product was that the Lakers survived, as a group and as a brand, to build on a legacy of championships and remarkable play. None of it more remarkable, though, than the work of Gifford and fellow pilot Vern Ullman that snowy night. The plane’s electrical system shut down, its radio went dark, the instruments and windows in the cockpit began to ice over. The Lakers players and staff shivered and sweated in the back, simultaneously. The pilots dipped low, seeking visibility, risking the treeline. Less than a year earlier, rock ‘n’ roll’s Buddy Holly‘s plane had gone done in similar bad weather in Mason City, Iowa. This time, pilot Gifford peered out an open side window and locked onto highway US-71 as a guide but couldn’t find a rural airport. The lights of tiny Carroll began to blink on as residents were awakened by the late-night roar of the plane’s engine. Aw, no sense trying to sum it all up here. Especially with the book out and available everywhere, in print and electronic forms, including here and here.